Congratulations to Jodi Wolfe who has been chosen as the client feature for September, 2016. Hear what Jodi has to say about her experience at SMARTCore Method . 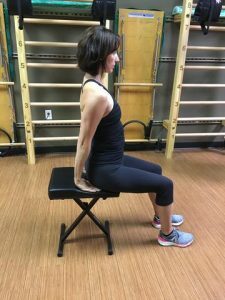 . .
My introduction to SMARTCore Pilates came about 3 years ago. I had just recently had my daughter and was feeling “sluggish”. My husband was seeing Kaylee for private sessions and would always come home and tell me how much I would love what she does. I have always been active my entire life especially in yoga and group exercise. Come to find out my sluggishness was not just from being tired with a young daughter. I was diagnosed with Stage 2 Non Hodgkins Lymphoma in December of 2013. Determined to beat the disease I knew diet and exercise would be crucial. I met with Kaylee and she agreed to teach me right through my treatments. Even getting down to 99 lbs and no muscle, she would tell me we are working what we need to for now and making you stronger. Her knowledge of the body’s movement and what it should and should not do is astounding. After the treatments ended I kept coming for more and was excited to see my body transform from a waif to long and leaner muscles. At 45 years old, I honestly feel the best I have ever felt in my life. Through my continued plant based diet and exercise routine I have no doubt I can keep the disease from returning. I feel my core is “awake” (where my tumors resided) for the first time as well. I am forever grateful to Kaylee, and all of the instructors at SMARTCore for their knowledge and true passion for helping me achieve optimal health! Every featured client of SMARTCore Fitness Method works hard to achieve better health—and you can, too! As Franklin’s fitness center of choice, SMARTCore Fitness Method can help you achieve better posture, alignment, and overall health through pilates, reflexology, and more. Contact us today to begin your fitness journey!